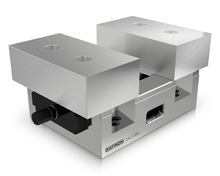 The encapsulated DATRON compact bench vice is 100% protected against contamination. Functional problems caused by soiling and clogged chips are now a thing of the past. It is distinguished by its low overall height and high clamping force. It is available with a guide lenght of 160 mm or 300 mm. Optional aluminium clamping jaws enable individual adaptation to component geometries.